The Image Quality Extension (IQE) is a member of the Aphelion™ Imaging Software Suite of image processing and analysis tools. It provides a methodology for automatically assessing the quality of digital images, stored locally or remotely. The quality of an image is very subjective since it highly depends on one’s perception of that image. It also depends on the ultimate goal for the use of the image in a specific application. Interpreting an image is different between two persons, who might have a different way to look at the image, a different way in mind to analyze the content of the image, and already thinking about the type of analysis and interpretation they want to perform on the image. For example, an ophthalmologist looking at a retinal image may rate the image’s quality as very good for lesion detection, while a non-retinal specialist may consider the image quality as poor since he/she does not know how to identify the lesions. IQE helps remove the subjectivity factor. Continuing with the retinal images example, the IQE process begins with ophthalmology experts manually grading a set of training images, assigning each to a specific class. In this example, there are five classes that characterize the visual quality of the image ranging from very poor to excellent. Next, and staying with the retinal image example, IQE generates a classifier engine which is used to automatically grade new retinal images. IQE contains a rich set of image descriptors, also called measurements (e.g., area, perimeter, texture, contrast). Associated with each descriptor is an algorithm that computes the value of that descriptor for each input image. IQE uses the training set of images and the grades assigned to each by the domain experts to determine which of the descriptors are the most relevant to accurately grade new retinal images. Please note that while the above explanation used the domain of retinal images, IQE is wholly general and can be used for any domain of images. For example, using IQ Annotator, which is included in IQE (Figure 1), the number of classes can be user defined along with their meanings, names, and numeric values. 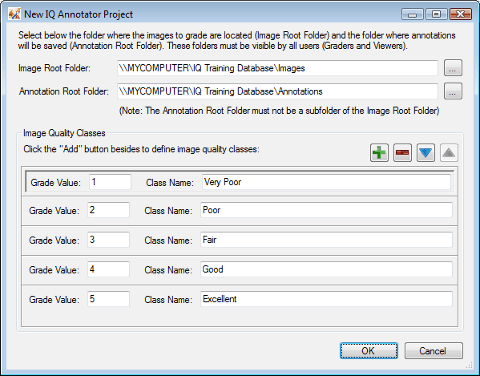 Build a training database by having domain experts use IQE Annotator to manually grade a training set of images. Compute the values of image descriptors (measurements) that characterize features of the image (e.g., area, noise, illumination, texture, presence/absence of edges). Generate a classifier engine specific to the image domain. 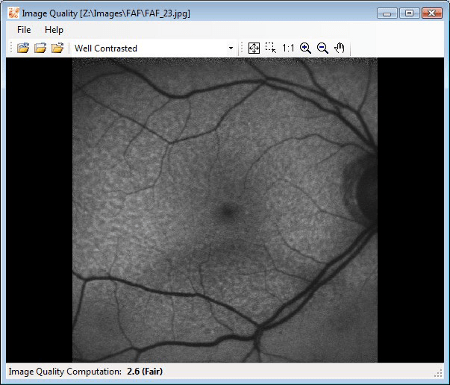 Evaluate a set of new images using the IQE Evaluator included in IQE. Descriptors are computed by an IQE descriptor engine. They result from measurements based on image processing algorithms included in the descriptor engine. 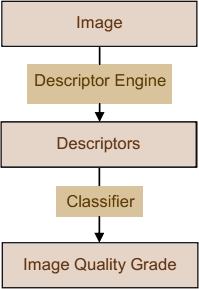 A set of descriptor engines is included in IQE, but developers can add their own descriptor engine that computes descriptors they have defined for their specific application and image domain. With the IQE Annotator interface, the expert can simply assign a specific grade to the image that is displayed on the screen. Shortcuts are provided to make the manual grading process easy. In addition, the content of the training database can be displayed as thumbnail images. This enables a grader to perform an initial visual evaluation of the entire set of images to be graded. After all images of the training database have been graded, a set of descriptor values is computed for each image based on the grades assigned by the experts. The user can add new descriptors appropriate for a specific application. These new descriptors are then added to the set of descriptors included in IQE. All measurements included in the Aphelion Dev product are available in IQE. The Random Forest method of classifying is one of the classifiers built into IQE. During the generation of the classifier, charts showing the generation progression are displayed in the user interface. Once the convergence is reached, the classifier is built and saved in a specific Aphelion format to be later used in IQE or other members of the Aphelion Imaging Software Suite. C# programming examples and images with associated classifiers are provided with IQE. 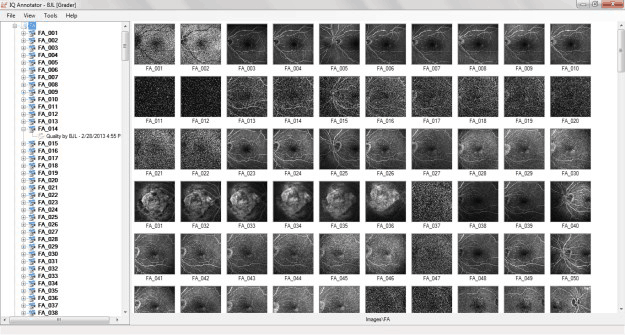 Once the classifier is generated, the user can evaluate one or a batch of images from the IQE interface, as shown below. Note that IQE is implemented as a general tool for automating the process of grading images for the occurrence of domain specific features and events that are visually recognizable to domain experts. IQE helps imaging technicians to capture good images that are later automatically processed by tools such as the Aphelion Dev software. In addition, a warning can be generated to let the technician know the image is not a good quality image and it needs to be recaptured. It also helps reduce the size of image databases by discarding low quality images that are meaning less and will never be automatically analyzed. Image Quality flyer available for download at the bottom of this page.